Cryptozoic Entertainment, leading creator of board games, trading cards, and collectibles, and Warner Bros. Consumer Products, on behalf of DC Entertainment, today announced the March 21 release of the Lynda Carter as Wonder Woman inspired vinyl figure. 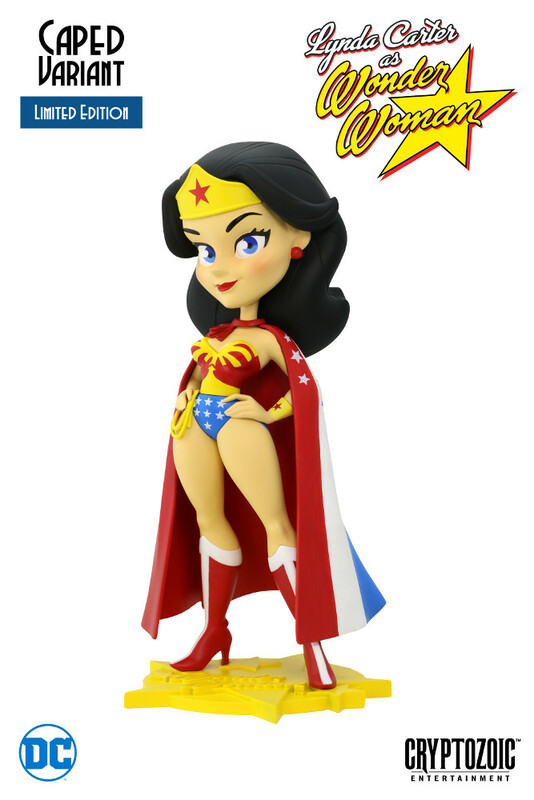 The 7-inch inspired by figure pays homage to actress Lynda Carter, who famously played the title character in the popular 1970s Wonder Woman TV series. In addition, a limited edition Caped Variant version of the figure—featuring a red, white, and blue cape—is available directly from Cryptozoic. Designed by Pedro Astudillo and sculpted by Anders Ehrenborg, both versions come packaged in display-worthy window boxes. The Caped Variant box is individually numbered from 1 to 1977, the total number inspired by the DC comic book, Wonder Woman ’77. “Lynda Carter’s performance as Wonder Woman is, simply put, iconic,” said Adam Sblendorio, Vice President of Creative at Cryptozoic. “We’re proud to be able to produce a dynamic figure that captures the look and spirit of one of the most recognizable versions of the character of all time. The Lynda Carter as Wonder Woman inspired vinyl figure will be available at retailers nationwide beginning March 21 for a suggested retail price of $29.99. The Caped Variant can be purchased directly from Cryptozoic—either via the company’s eStore or at events throughout 2018, starting at WonderCon Anaheim—for $39.99. Will you be picking up this iconic character? Let us know in the comment section below. Also, don’t forget to like, share and subscribe to all things Constant Collectible in order to keep you up to date with all the news & reviews from the world of GEEK CULTURE.